Hey - can YOU think of a reason to strap one of these to your face? Build 2015 Microsoft is serious about HoloLens, and devoted some stage time during Wednesday morning's keynote at the Build conference in San Francisco to explain how its futuristic headset will be more than just a fancy toy. Game developers are reportedly already exploring the possibilities inherent in a headset that can superimpose computer generated 3D "holograms" over the real world. But HoloLens honcho Alex Kipman said the device would be transformative for education, the workplace, and everyday life, too. Kipman proceeded to walk the audience at Build through a series of new demos that illustrated various application of Redmond's space-specs. For each, a presenter wearing a HoloLens headset flailed around on what looked like an empty stage, while the audience was shown a large-screen video simulation of what the presenter was seeing. In one demo, a man identified as "Darren" reclined in a mock-up of his own apartment while various virtual screens and objects glowed on the walls and around his virtual space. Kipman explained that these were more than just 3D objects too look at. 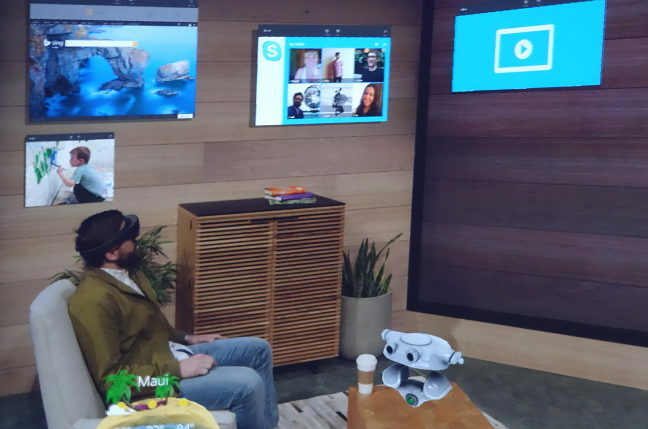 Each item in the demo was a representation of a Windows 10 Universal App, he said, and any such apps could be made to work with HoloLens. "Darren" apparently doesn't leave the house much – and why should he, with all this cool virtual stuff around? In the demo, "Darren" hung a Skype widget on one wall of his apartment to remind him to keep in touch with his family and friends. On a coffee table next to his couch, a simulated weather widget buzzed away, giving him temperature updates for his planned trip to Hawaii. Still another windows acted like a virtual TV for streaming video. All of these virtual widgets could be manipulated using hand gestures. "Darren" could pinch in midair to resize the TV window, for example. If he said "follow me" out loud, on the other hand, he could walk around the room and the TV would float along with him at the same distance. 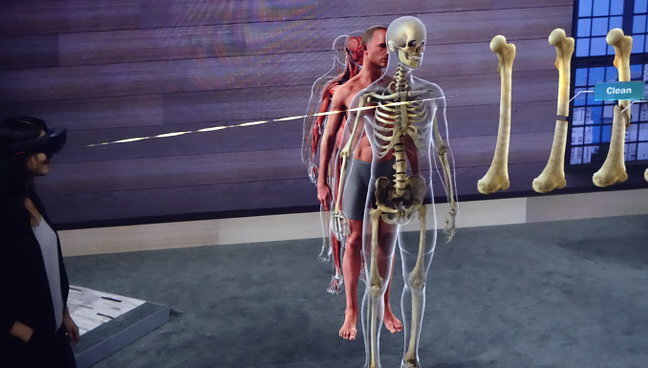 In another demo, a woman showed how medical schools could replace the traditional books-and-cadavers method of teaching anatomy with a 3D "hologram" of the human body. When she pointed to a given body part, it would expand to show the various skeletal, circulatory, and muscular systems that made it work. The same idea could be applied to various other fields of study that could benefit from spatial understanding, Kipman said, including chemistry, art history, engineering, or paleontology. Leaving no buzzword stone unturned, Kipman explained that HoloLens could even be applicable to the nascent Internet of Things. To illustrate, a presenter rolled a small wheeled robot out onto the stage. But this little real-world rover, identified as "B15," was only half of the application. A human wearing a HoloLens could control the robot by calling it by name, at which point a virtual head and arms appeared in midair immediately above the physical robot's position. A few arm gestures called up the control interface for the robot, which took the form of an array of hovering controls reminiscent of the kind of interfaces made infamous by the movie Minority Report and that Hollywood has been in love with ever since. Will the REAL B15 please stand up? Actually, he can't. 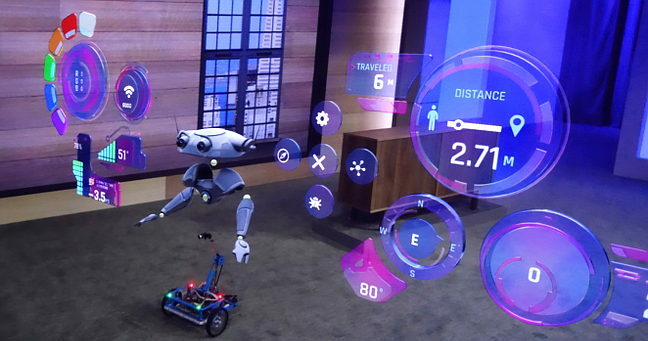 Everything but the little wheeled fella on the ground is a "hologram"
Besides providing a UI for B15, however, the HoloLens also played an integral role in how the robot functioned. "B15's sensors aren't good at detecting obstacles, but they don't have to be," the presenter explained. "My HoloLens can communicate that information." Kipman said Microsoft brought HoloLens to Build because it wants developers to help come up with even more ideas for how the technology can be used. And to get them excited, the software giant is giving them a crack at using the technology themselves.